Every Sunday we try to get to the Farmers Market. 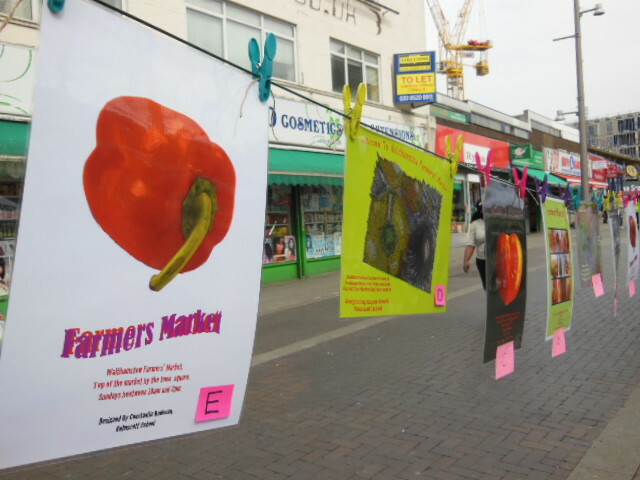 This week was the judging of the Kelmscott School Farmers Market poster competition – we couldn’t agree of course! But it seemed a good chance to wander around with the camera and take you on a crawl of what’s on offer at our lovely Farmers Market. We started off with the cheeses – tasting as we went. The Saint George goats cheese from Nut Knowle Farm in East Sussex is an award winner. They also have a whole range of soft goats cheese logs from a moreish sweet stem ginger to a fiery chilli. We love the traditional Cheddar from Batch Farm, but also keep a look out for their mis-shapes bags which are a bargain for cooking – grate and freeze the cheese so it’s ready to go straight onto pasta, gratins and so on. The mozzarella produced from organic raw buffalo and cow milk by Alham Wood Cheeses is another excellent cheese from Somerset. It’s £4 for a hefty lump of cheese. The buffalo milk makes it higher in calcium and protein and lower in cholesterol than standard mozzarella. They have other buffalo cheeses based on traditional Romanian recipes including one with cumin seeds. Giovanni, of Walthamstow-based The Seriously Italian Company puts passion and enthusiasm into producing a range of hand made pastas, sauces and pestos. We particularly like the Spelt Casarecce – meaning ‘homemade’, which are loosely rolled pasta tubes that work nicely with chunky sauces. Pick’s Organic Farm and Shop from Leicestershire bring a range of meat and sausages to the market. 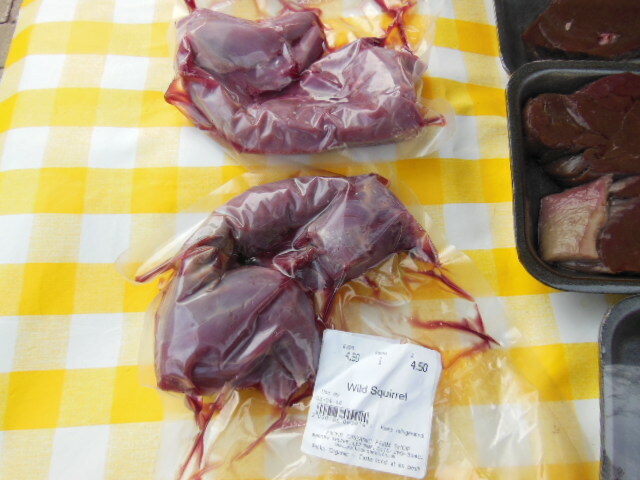 These include venison sausages, Dexter beef and salt beef plus some more exciting meats such as wild rabbit and squirrel! 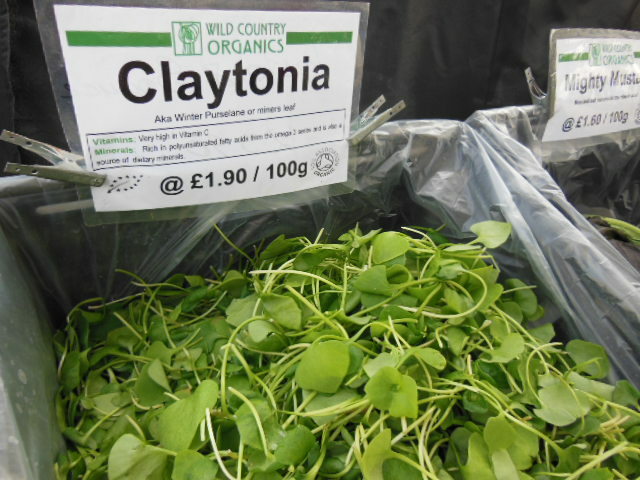 Today Wild Country Organics had Claytonia, also known as Winter Purslane or Miners Lettuce. This is an unusual winter salad rich in vitamin C.
Getting good quality, sustainable fish in the Stow isn’t always easy so we like the Seafayre stall, selling fish from Dungeness, off the Kentish coast. Seafayre is a family affair operating from two boats using static net fishing, which is more environmentally friendly fishing. 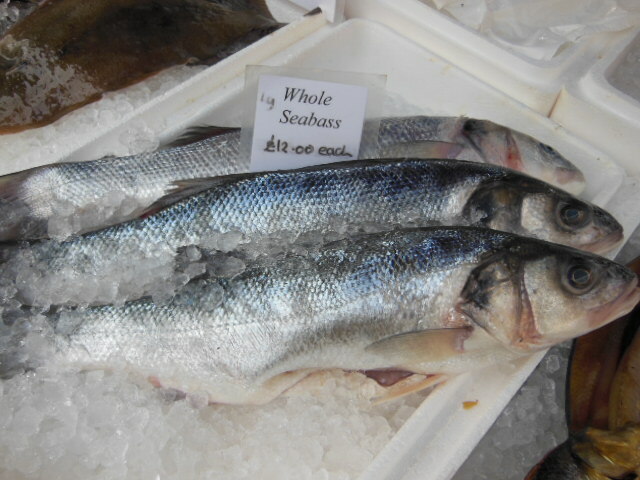 The fish each week depends on the weather and the season. Helpfully they send out a weekly email to let you know what they’ll be bringing to the market – send them an email and I’m sure they will add you to their email chain. Pasture Farm Poultry bring free range poultry including chicken, duck, geese, turkey and guinea fowl to the Farmers Market – invaluable at Christmas. They sell chicken carcasses for £1 each, which make a fantastic stock. The meat is dense so a bird will often make us 2 or 3 meals. 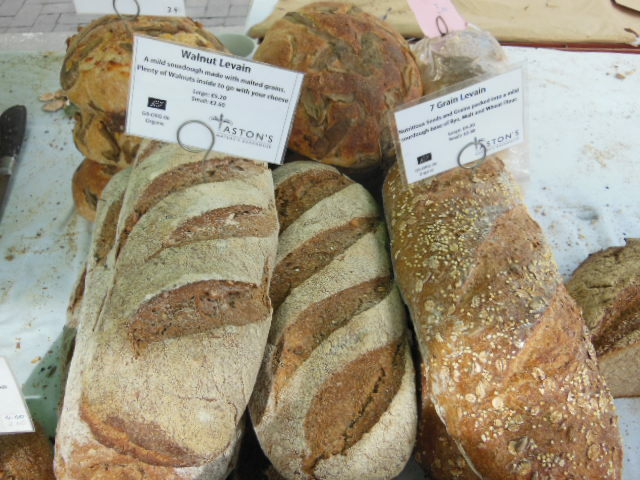 We like bread from North London’s Aston’s Organic Bakery stall. They have loaves of all different varieties – mixed, slow fermented and shaped by hand. 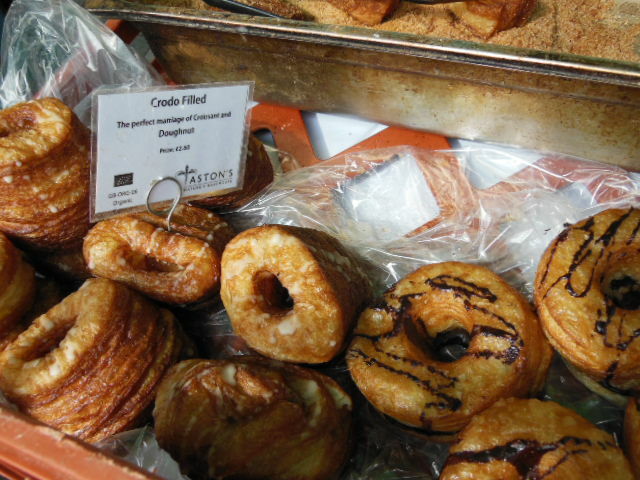 But more importantly they have homemade filled Crodos! This entry was posted in Markets and tagged Astons Organic Bakery, Batch Farm Cheese, Nut Knowle Farm, Pasture Farm Poultry, Pick's Organic Farm and Shop, Seafayre, Sunday Farmers Market, The Seriously Italian Company, Walthamstow Farmers Market, Wild Country Organics. Bookmark the permalink.